Family adventures will never be the same when you get behind the wheel of the “Swagger Wagon” at Downeast Toyota. Nicknamed the “Swagger Wagon”, the Toyota Sienna provides families with a stylish, fun-to-drive and family-friendly minivan that promises to upgrade your next family adventure. Explore the latest iteration of this world-class Toyota with this in-depth overview of the 2019 Toyota Sienna near Bangor, ME. Find the 2019 Toyota Sienna that best fits your lifestyle and budget at Downeast Toyota with five family-friendly trim levels to choose from – L, LE, SE, XLE and Limited – that will start at $31,115. Toyota Sienna LE and XLE trim levels are available with an Auto Access Feature to make the “Swagger Wagon” more handicap accessible. 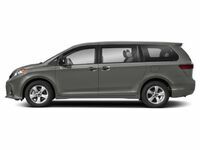 With room for seven or eight passengers, the Toyota Sienna is tailor-made for family and will add 39.1 cubic feet of cargo space behind the third row that is perfect for day-to-day errands. What Are the 2019 Toyota Sienna Trim Levels, Features and Design Specs? When families hit the road in the 2019 Toyota Sienna near Bangor, ME, they will enjoy an athletic performance, a wealth of family-friendly features and a capable design that is perfect for all chores, no matter how big or small. Toyota Sienna entries are powered by a 296-horsepower 3.5-liter V-6 engine that is paired with an eight-speed Direct Shift automatic transmission to achieve 19 mpg in the city and 27 mpg on the highway. Class-exclusive Dynamic Torque Control All-Wheel Drive will improve performance when faced with Maine winter weather. When properly equipped, the Toyota Sienna will tow up to 3,500 pounds of cargo. No matter which Toyota Sienna trim level you choose, you will enjoy a long list of features that will upgrade family road trips. Entry-level Toyota Sienna L trim levels feature 17-inch alloy wheels, automatic headlights, tri-zone automatic climate control, a rearview camera and keyless entry. A 7-inch Toyota Entune™ 3.0 touchscreen infotainment system comes standard and provides one-touch access to Bluetooth, Apple CarPlay and available Wi-Fi. Safety is a highlight of the Toyota Sienna that starts with Toyota Safety Sense™ technology that includes a Pre-Collision System with Pedestrian Detection, Lane Departure Alert with Steering Assist, Automatic High Beams and Dynamic Radar Cruise Control. With family at its core, the 2019 Toyota Sienna can be equipped with many features that will upgrade your next family adventure. When siblings go to battle in the third row, the Driver Easy Speak feature allows parents to restore the peace, using the built-in voice-command system to project parental commands to the back seat via the Toyota Entune™ 3.0 sound system. To avoid sibling conflict, the Toyota Sienna can be equipped with a Dual View Entertainment Center that employs a 16.4-inch widescreen display that can be used as a single screen or dual screens with multiple entertainment sources that include Blu-Ray capabilities.